I was wondering why Northwestern had so far failed to offer my as-yet-to-be-conceived (as far as I know) grandson, Now I know. Thanks for the info! yeesh ... so let's assume average of 20 schollies are available each year for FBS level ... I'm adjusting mentally for normal attrition (increases schollies available) and redshirt-ting (decreases schollies available since many players use 5 years of scholly money). So I'm curious how much this has increased over the last 2 or 3 decades (going to guess internet has made this worse) ? And what is an optimal ratio of offers to schollies available ? 4 to 1 .. that is, assume you recruit in a way that requires you to hit on 25% of your offers. Can't ignore kids are getting less patient about sitting on 2 and 3 deeps while waiting their turn to play ... plus the internet makes it so much easier to market yourself. So colleges presumably had to up the ratio to deal with these realities. I can't wait to see the new 2019 roster. See who was added along with who may have left the program for whatever reason. And with schools handing out 100, 200, 300, 400 plus offers a year - who knows how many times this **** happens. Who knows who actually has an offer from anyone. Hell, a real kid with real film can just start tweeting out he's received an offer from a handful of P5 schools and ****ing no one is going to know he's full of ****. 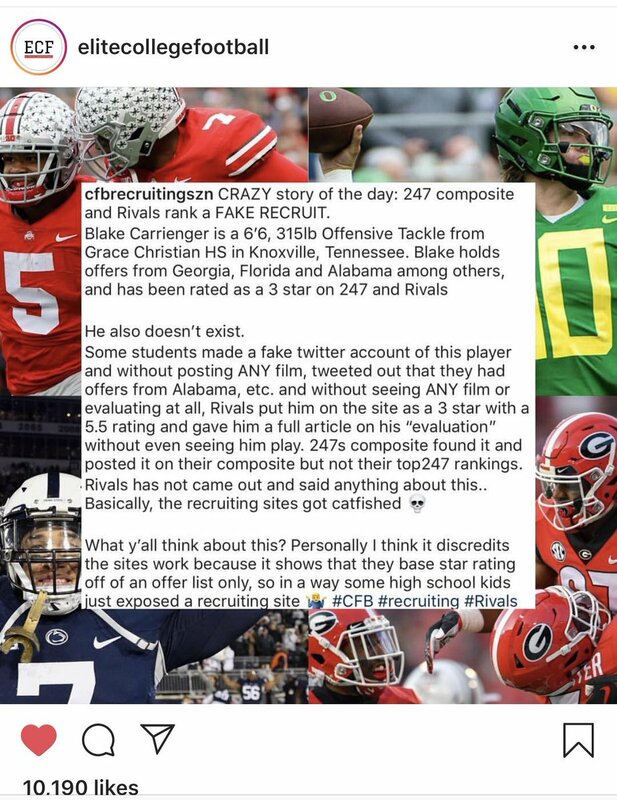 Rivals should be very ashamed and immediately re-evaluate how any kid gets their first valuation ... love that they got exposed for shoddy investigative handling. I have basic idea how Rivals works, only because I had a son who played football in the Chicago Metro area. One of the Rivals analysts is a HS sportsbeat writer, blogger, scout who takes his job very seriously. His name is Tim McIntyre and goes by EdgyTim. He stakes his reputation on how he doles out stars and would never give anyone stars unless he saw them in person or on tape, and then was able to verify the kid for himself. He also knows and considers combine results ... he knows the ones that allow BS times in 40's and verticals. Some you take with grain of salt, some you believe. Yes, it is easy to get a BS vertical if they let you shrug your shoulders and chin down when they measure your arm reach standing .. you can add 4 to 6 inches to your vertical if they let you shrug enough and then slightly dip your knees with baggy sweats on. And hand timed fortys are very easy to fudge by 0.2 seconds .. difference between 4.7 and 4.5 is nothing to a hand held time, but everything to a kid trying to get interest. Kids see this and want to go to that combine so they can fluff up their numbers. Want to know if a particular combine is BS ... compare their verticals with another combine ... if you see a bunch of kids jumping upper 30's and lower 40's ... your BS meter should be spiking. Anyway, in the case of EdgyTim and the work he does for Rivals in Chicago area, the integrity behind his stars and scouting reports is way up there. He is NOT doing it for the clicks and popularity aspect. He lets those chips fall where they may .. and he's been doing it for a long time. So not all of Rivals is out of control, but apparently it is deteriorating badly. Last edited by Redbird 4th & short; February 14th, 2019 at 08:58 AM. I worked for rivals in Iowa. The guy that runs the Iowa site does a great job. But the national **** is real bad. I second this. EdgyTim is a very solid source in our region. The Aggies got a couple of linebackers, and focused on upgrading talent in the defensive backfield. They also stacked RBs, TEs and WR. Completely reloaded with youth at the skill positions on offense. Note that Davis started 4 freshmen on their OL last year.